Neratinib is used to treat breast cancer after treatment with certain other medications (such as trastuzumab). Neratinib belongs to a class of drugs known as kinase inhibitors. It works by slowing or stopping the growth of cancer cells. Read the Patient Information Leaflet if available from your pharmacist before you start taking neratinib and each time you get a refill. If you have any questions, ask your doctor or pharmacist. To help prevent diarrhea, your doctor should prescribe anti-diarrhea medication (such as loperamide) for you to take on a regular schedule during the first 2 months of treatment with neratinib. Follow your doctor's directions to continue taking anti-diarrhea medication on a regular schedule or to take it only as needed. Medications which reduce or block stomach acid (such as proton pump inhibitors-PPIs, H2 blockers, antacids) may reduce the absorption of neratinib, making it work less well. Do not take PPIs (such as omeprazole, lansoprazole) or H2 blockers (such as famotidine, ranitidine) while using this medication. If you take an antacid, take it at least 3 hours before taking neratinib. What conditions does Nerlynx treat? Nausea, vomiting, mouth sores/pain, stomach/abdominal pain, loss of appetite, weight loss, tiredness, dry skin, nail changes, or muscle spasms may occur. If any of these effects last or get worse, tell your doctor or pharmacist promptly. Diarrhea is a common side effect. Drink plenty of fluids as directed by your doctor to lessen your risk of losing too much body water. Your doctor should prescribe anti-diarrhea medication (such as loperamide) to help control your symptoms. Tell your doctor right away if you develop diarrhea that is severe or doesn't stop, or signs of dehydration (such as unusual decreased urination, unusual dry mouth/thirst, fast heartbeat, dizziness/lightheadedness). Your doctor may prescribe additional anti-diarrhea medications or temporarily stop/adjust your dose of neratinib. Tell your doctor right away if you have any serious side effects, including: severe stomach/abdominal pain, yellowing eyes/skin, dark urine, signs of kidney problems (such as change in the amount of urine). Neratinib can commonly cause a mild rash that is usually not serious. However, you may not be able to tell it apart from a rare rash that could be a sign of a severe allergic reaction. Get medical help right away if you develop any rash. List Nerlynx side effects by likelihood and severity. Before taking neratinib, tell your doctor or pharmacist if you are allergic to it; or if you have any other allergies. This product may contain inactive ingredients, which can cause allergic reactions or other problems. Talk to your pharmacist for more details. Tell your doctor if you are pregnant or plan to become pregnant. You should not become pregnant while using neratinib. Neratinib may harm an unborn baby. Ask about reliable forms of birth control while using this medication and for at least 1 month after stopping treatment. If you become pregnant, talk to your doctor right away about the risks and benefits of this medication. It is unknown if this medication passes into breast milk. Because of the possible risk to the infant, breast-feeding while using this drug and for at least 1 month after treatment is not recommended. Consult your doctor before breast-feeding. What should I know regarding pregnancy, nursing and administering Nerlynx to children or the elderly? Some products that may interact with this drug are: drugs that reduce stomach acid (such as antacids, H2 blockers such as famotidine/ranitidine, proton pump inhibitors such as omeprazole/lansoprazole). Other medications can affect the removal of neratinib from your body, which may affect how neratinib works. Examples include azole antifungals (such as ketoconazole, itraconazole), boceprevir, macrolide antibiotics (such as clarithromycin), nefazodone, HIV protease inhibitors (such as indinavir, nelfinavir, ritonavir), rifamycins (such as rifabutin, rifampin), St. John's wort, drugs used to treat seizures (such as carbamazepine, phenytoin), telithromycin, among others. Does Nerlynx interact with other medications? Should I avoid certain foods while taking Nerlynx? Lab and/or medical tests (such as liver function) should be done while you are taking this medication. Women of childbearing age should have a pregnancy test before starting treatment. Keep all medical and lab appointments. 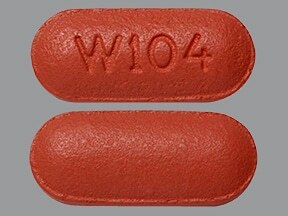 This medicine is a red, oval, film-coated, tablet imprinted with "W104". Are you considering switching to Nerlynx? How long have you been taking Nerlynx?